When I began considering this D.VII project, my highest priority was a reliable, enjoyable aircraft that would invoke a minimum of anxiety when flying over the trees. I have experience with two-stroke and alternative engines and this was not the path I wanted to take with this aircraft. The choice of the Continental O-200 is not in the mainstream of engine options for AA aircraft, but there probably isn't an engine more reliable than the little four-banger that has powered thousands of Cessna 150s. The D.VII in particular is usually powered by an engine that fits inside the narrow cowl in order to present an authentic appearance. But simplicity and reliability are higher priorities for me than authenticity. 95% of the folks who will enjoy seeing this aircraft on the ramp won't have a clue as whether or not the plane closely models a D.VII...they will just think it is a really cool "WWI" airplane. So I knew the cowl was going to be a challenge. I had some vague ideas about how to incorporate the protruding heads but it wasn't until today that I could finally begin to visualize the task ahead. For the first time the engine is hanging on the mount unaided and I could hang the nose bowl in close proximity to the engine and get an idea of how things fit together. Here is the very un-Fokker-like cowl situation. All along I've envisioned some sort of cheek cowls to enclose the heads but thinking through how to baffle the engine to keep it cool inside a pressure cowl was...well...baffling. As is often the case, similar to designing the engine mount, new ideas come about when the mind is released from pre-conceived bias. The more I looked at the cylinders protruding from the cowl the more my mind traveled back to a Continental-powered vintage yellow aircraft I hold dear to my heart. I am leaning heavily toward taking a path certainly different from other D.VII builds, and different from what I had considered previously. And the new path could relieve me of the burden of engineering baffles in the unfamiliar Fokker cowl. The purists may be offended, but I build airplanes I enjoy flying. I spent some time in a local shop making patterns from a set of J-5 eyebrows (thank you, Mark). This gives me patterns for either eyebrows or the basis for a baffle or plenum. There is much more than TLAR engineering (That Looks About Right) involved in taming and directing airflow around the O-200 cylinders. Piper no doubt spent many hours figuring out how to flow air through the fins because this is usually non-intuitive, more black art than science. I have no desire to reinvent engine baffles so will use the eyebrows as the foundation for whatever scheme I decide upon. 1) Use the eyebrows as intended with a very narrow cross-section nosebowl. The small nose bowl of the J-3 most likely accelerates air into the eyebrows and is an integral part of the cooling system. However, this would drastically change the aesthetics of the D.VII and the fuse cross-section doesn't lend itself to this option. 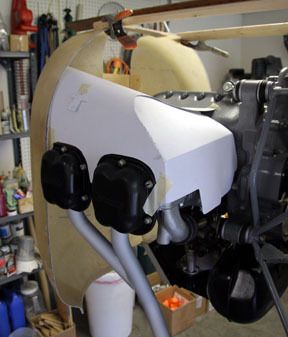 2) Build a conventional pressure cowl that is wide enough to enclose the cylinders and incorporate a traditional baffle system. 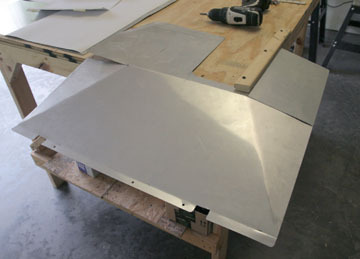 I have the original C-150 baffles and they could be used as the basis for fabricating baffles. However, this would require a huge nose bowl many inches wider than the fuse and would look really weird. 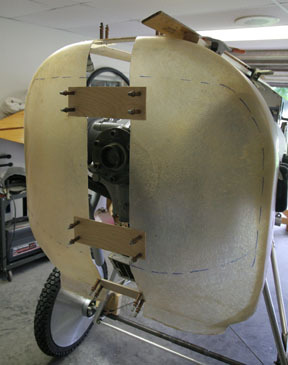 3) Fabricate a pair of plenums based on the eyebrows that will fit within a slightly wider nosebowl. 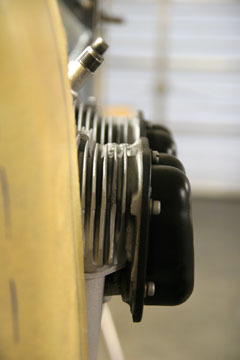 This will leave the valve covers outside the cowl--they can remain exposed or be covered with shallow cowl cheeks. This photo gives a glimpse of option #3 which I have decided to try. The eyebrows can retain their basic shape but be customized to mate with the nosebowl at their leading edges. 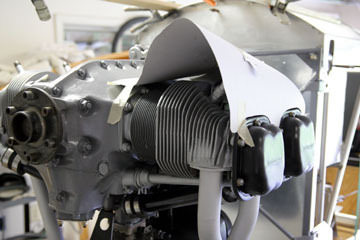 An alternative would be to make a single plenum that covers the entire top of the engine and feeds both sides of the engine which would be similar to a pressure setup but easier to seal. I split the nosebowl and added ~4.5" to the width so the eyebrows/plenums would fit inside it. This largely retains the intended appearance of the D.VII without being overly "fat". 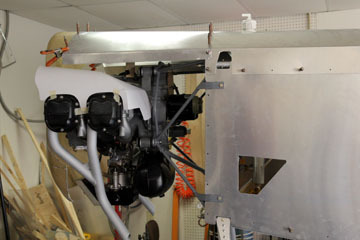 The cowl sides, top, and supporting structure are the devils in the details and may require more than one effort at finding a satisfactory solution. 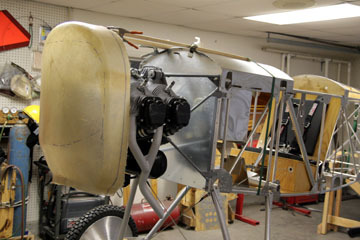 The J-3 nosebowl is hard-mounted to the engine but I think it better to isolate the D.VII nosebowl from the engine if possible. The cowl sides must flare out slightly forward ahead of the firewall to mate with the nosebowl. My first try was to bend a slight jog in the sheet and this has promise, just needs refinement. After wrestling with the compound curves I'm thinking it will be best to add cheeks over the valve covers to add rigidity to the cowl sides. Some creative metal work will be needed to stitch all the joints together. 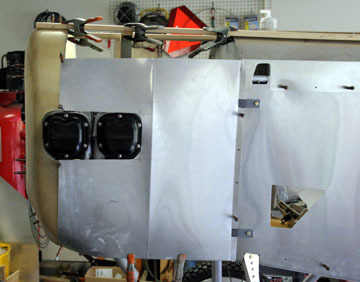 The left cowl side which started out as a mockup is now looking more like a finished piece. This sheet is getting pretty complicated, there are more than a dozen cuts and bends so far. Two of the cuts will be riveted together in the following photo. I finally figured out how to transition from a curved section to a straight edge. The new diagonal bends did the trick along with slicing the sheet in two places, pulling the edges into a straight line, then riveting everything back together. This would be old hat for an experienced sheet metal worker but I'm having to learn this as I go. This photo is deceptive because the side doesn't protrude nearly as much as it appears in this view. Here is a more accurate angle. 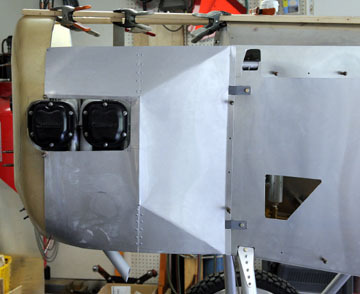 The cowl side only expands from the fuse dimensions about two inches. I'm thinking I like the valve covers hanging in the breeze, probably won't cover them with fairings. reboot; (verb); (narratology) To discard all previous continuity in a series and restart the series. The more I investigated what would be necessary to bring the cowl to operational status while retaining the ability to service the engine, the more complicated things became. Every feature needed just added another layer of complexity. 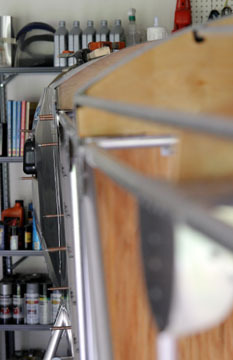 I have been building things long enough to know the most elegant design solution is often the simplest. It was time to take a much simpler path. I decided to return to the J-3 scheme of exposed eyebrows and build a cowl around them. 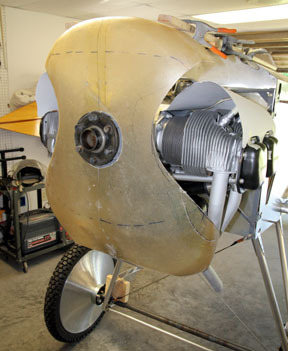 In spite of compromises to aesthetics, the Fokker nose bowl would be trimmed as necessary to incorporate the eyebrows and eliminate any need for plenums, baffles, associated seals, and hinged inspection doors. Another poster board eyebrow was made for the right cylinders so I could visualize the finished configuration. After some time with a Sharpie and jig saw, this is what resulted. A few minutes with fiberglass resin and cloth had the nose bowl back in one piece. There is just no way to conceal a wide engine in a narrow airplane, so instead of trying to hide the O-200, I'm flaunting it. Still undecided about how to secure the cowl and where to put the seams. The top is clecoed into place and it really planted the nosebowl into place. First-time builders need to remember there is no dishonor in resorting to Plan B, or C, or whatever. Each reiteration expands the knowledge base and brings one closer to the final solution. I am including the stops and starts of this phase of construction so new builders can understand the thought processes often needed to find solutions to problems. This is especially necessary when plowing new ground. This may or may not be the final solution, but it will be the one present for first flight.